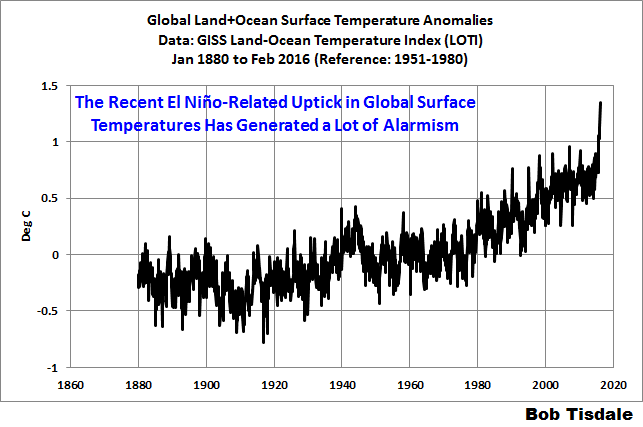 Despite the usual alarmist rants from predictable sources and their compliant media outlets, there is absolutely nothing alarming about the predicted cyclical uptick in February 2016 global temperatures. As we have mentioned here previously, the strong El Niño (not global warming) is to blame, and if one compares the current El Niño response to the 1997/98 El Niño response as Bob Tisdale has done so skillfully here, it is absolutely clear that the two are nearly identical. 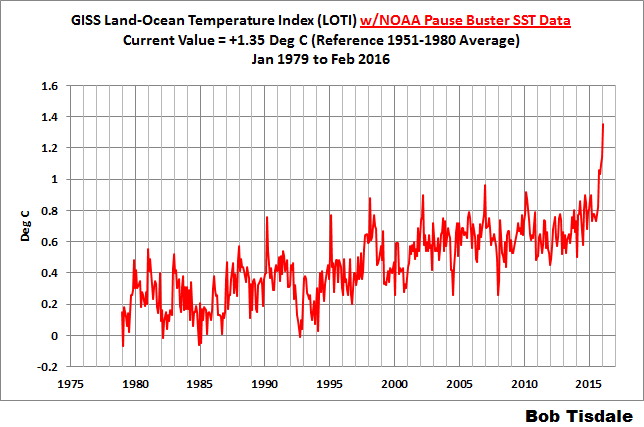 If anything, the response to the 1997/98 El Niño was slightly stronger. Another survey of 4,092 members of the American Meteorological Society (AMS) from George Mason University (home of Shukla and the RICO20) on climate change attitudes in that organization was released yesterday. However, the survey itself is tainted with the stench of the RICO20 and their calls for prosecution and jailing of “climate deniers”. The survey results show a general acceptance of the view that climate change is happening, and that the cause is partly due to human activity, but there is a contingent that sticks out like a sore thumb. Over at Climate Audit, Nic Lewis has outlined the latest developments in the saga of the Marvel et al paper, which claimed to have demonstrated that climate sensitivity is low, but appeared to have a whole series of problems, not least of which that it had got its forcing data mucked up, leaving out land-use changes entirely. In a typically erm…robust article at RealClimate, Gavin Schmidt ignored all the evidence Lewis had presented showing that land-use change had been overlooked, and said that Lewis’s critique was made…without evidence. However, it now seems that he has decided that this position is not tenable, at the journal at least,and a correction has been issued admitting that land-use was indeed missing.